This morning I came to work. Sat down at my desk, turned on my computer. My usual routine results in opening my twitter screen, facebook screen, and my blogs screen. 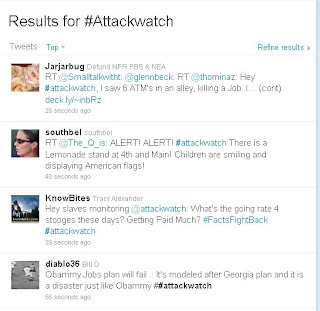 My first message on twitter was a reference to the tag #AttackWatch. I found myself reading the tweets with that tag. Must admit it was entertaining.....for a conservative. 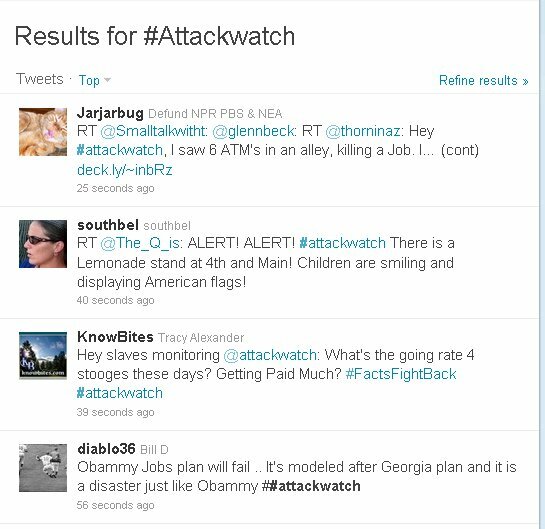 This tag references this website - Attackwatch which is Obama trying to reply to all the "smear campaigns" by arming people with the "Truth". Hey guess what Obama, I think you are getting more negative responses on Twitter. You need to answer all the responses on that twitter tag! "When we spotted this,﻿ we were watching the coverage LIVE on a 65" HD tv. You couldn't deny it if u wanted to... I admit, it is hard to see on a 6" youtube screen, but u STILL have to be in denial to refuse her obvious disgusted facial expression............."
I leave it to you to decide what was said. I know what I saw. Hey I can't make this kinda stuff up!